Humanity has been brought to the brink of extinction. Each night, the world is overrun by demons—bloodthirsty creatures of nightmare that have been hunting the surface for over 300 years. A scant few hamlets and half-starved city-states are all that remain of a once proud civilisation, and it is only by hiding behind wards, ancient symbols with the power to repel the demons, that they survive. A handful of Messengers brave the night to keep the lines of communication open between the increasingly isolated populace. I wasn’t going to read this because it’s limited edition, the first real limited ultra special book I’ve ever bought (only 700 copies were made of this particular edition, which makes me want to lock it up in a glass container and shout at people when they even glance at it or something), but I couldn’t help myself. I’m glad I did because now I know a little bit more of Arlen’s story and world outside the Demon Trilogy. Even though it is from the Demon trilogy and follows the same main character, you can still read it without there being any real spoilers. For those who haven’t read the first book and want to read Brayan’s Gold, it’s ok because it drops information enough to keep you interested and intrigued about what has happened prior to this tale, but not enough to ruin the story for you. As for old fans it’s a nice novella to add to the story and enhance Arlen’s life and world for you without being a necessary read. 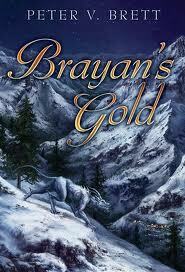 I think that’s the main thing I like about Brayan’s Gold, besides all the special goodness to it, is that it expands the world Arlen is from without forcing you to read it as part of the overall story. The only really downside to this novella is that now I really want to get a copy of The Great Bazaar (I’ve tried this before, but missed out and what I could find I am not spending that much on, no matter how awesome the author is. I’d rather invest in a Guqin, instead of a book, if I had that amount lying around) more than before and it’s enough to wet your whistle on if you’re hanging for the next book in the trilogy, but it is also a tremendous tease. It’s actually quite perplexing because I’m glad I’ve read it, but now I’m hanging even more for the next instalment and I want to read more about Arlen’s earlier life. My edition is illustrated with art by Lauren K. Cannon (her art is excellent) and I love it because it’s great to see Arlen, not just read him, but it’s also great because it shows some demons and there’s expression in the art too. It’s really lovely art, adding to the story as a whole, but not a must for fans who can’t get an illustrated copy. It does help that Brayan’s Gold isn’t overrun with art either, it’s a little here and there, so while it can enhance it doesn’t really affect it as a whole and doesn’t end up making it feel like a graphic novel or close to. If you haven’t gotten a copy of it and would like one check out Subterranean Press to see if they have any left and if you’re curious about the art they also show some of that on their web page.